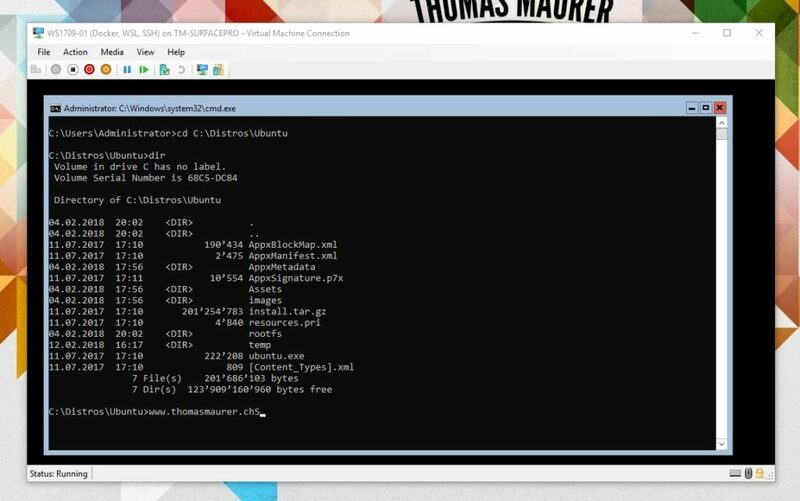 In 2017 Microsoft made it possible to run different Linux distribution on Windows 10, using a feature called the “Windows Subsystem for Linux“. 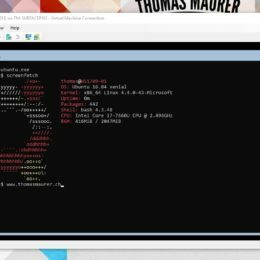 With the latest official Semi-Annual Channel Windows Server release called Windows Server, version 1709 Microsoft also allowed to run the Windows Subsystem for Linux (WSL) on Windows Server. With the next release of Windows Server called Windows Server, version 1803, Microsoft will also add some improvements to the Windows Subsystem on Linux, which also apply to Windows 10 as well as Windows Server. This blog post shows you how you can do this. If you are running on Windows Server Core (which is highly likely), you can use the following command to download the Linux distributions. Now you can open that folder and run the installer for example ubuntu.exe. The first time this will do the setup where you also define the UNIX username and password as well as the root password. After that you can run updates for your distro and you can start using Linux. You can also find the other Linux distro packages here: WSL distro packages. If you are running Hyper-V on Windows 10 or on Windows Server 2016, you probably know about a feature called PowerShell Direct. I also mentioned that PowerShell Direct is one of the 10 hidden features in Hyper-V you should know about. 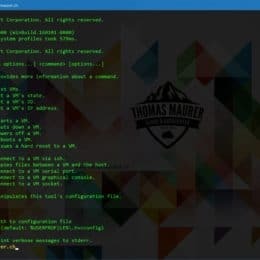 PowerShell Direct lets you remote connect to a Windows Virtual Machine running on a Hyper-V host, without any network connection inside the VM. 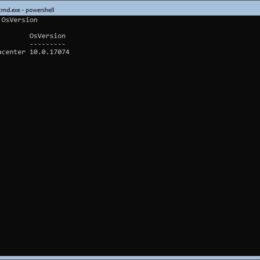 PowerShell Direct uses the Hyper-V VMBus to connect inside the Virtual Machine. Of course this feature is really handy if you need it for automation and configuration for Virtual Machines. As this is great for Windows virtual machines, it does not work with Virtual Machines running Linux. In the latest Windows 10, Windows Server 1803 (RS4) and Windows Server 2019 (RS5) Insider Preview builds, Microsoft enabled a tool called HVC. HVC is at tool which allows you to do some command line VM management. HVC SSH is basically SSH Direct of Linux VMs. This allows to connect to a Linux VM using SSH over the Hyper-V VMBus. You are also able to copy file inside a virtual machines using scp. To connect to Linux VMs using SSH Direct (HVC) simply type hvc.exe into the command line or PowerShell. This will give you all the possible command options. Of course SSH has to big configured inside the Linux virtual machine. To make this work, the SSH server inside the VM needs to be configured. Pretty cool tool which will be available in the official releases of Windows 10 and Windows Server 1803, released this spring. Later this year this feature will also be included in Windows Server 2019. If you want to try it out today, give the Windows Insider Preview builds a spin. Yesterday, Microsoft announced a new Windows Server Insider Preview Build (17074) which will be released as the next Semi-Annual Channel release for Windows Server. This release will likely be called Windows Server 1803 (Codename: Restone 4), which is aligned to the Windows Client releases. Microsoft talked about improvements in the next Windows Server releases and the investments in Containers and Storage Spaces Direct at Microsoft Ignite 2017, and we already got some early Windows Server Insider Preview builds to see what is coming next. The official list is not to big right now, but we can expect Microsoft to add and announce more features in the comment weeks and months. Storage Spaces Direct adds support for Persistent Memory (Storage Class Memory), which brings very fast and very low latency storage to S2D. The prices for this devices is still pretty high, but we can expect this to change in the future and we can also see them as a great use as caching devices. CSV Cache is now enabled by default, which delivers an in-memory write-through cache that can dramatically boost VM performance, depending on your workload. Azure enlightened Failover Cluster – This is a very exciting feature if you run Windows Server Failover Clusters in Microsoft Azure. This feature will let the Windows Server cluster know if there is Azure host maintenance going on and will exclude the specific cluster node from placing workloads on it. By making high availability software running inside of an Azure IaaS VM be aware of maintenance events of the host, it can help deliver the highest levels of availability for your applications. Microsoft promised to add more Container feature and provide updated Windows Server Container Images. One feature which made it already into this and early Preview builds is a long waited feature which caused some confusion before. Developers can now use localhost or loopback (127.0.0.1) to access services running in containers on the host. As mentioned before we can expect Microsoft to add and announce new feature for the next Windows Server release in the next couple of weeks and months. You can download the Windows Server Insider Previews from the Windows Server Insider Preview download page. If you are not yet an Insider, check out how to get one on the Windows Insider for Business portal. Careful, this is pre-release software and it is not supported in production. For Microsoft it is very important that they get feedback about the latest releases. To send feedback use the Feedback Hub application in Windows 10, and choose the Server category with the right subcategory for your feedback.